Zungulila is sited in an untouched section of the South Luangwa National park and run by Bushcamp Company with excellent guiding and offers guests an exclusive experience to explore Africa as it used to be in the days of the explorers. Safari activities are conducted on foot in order to preserve the integrity of this unspoilt section of wilderness. Exploring this pristine region on foot harkens back to the exploratory days of Africa creating a truly authentic bush experience for walkers. The exploratory route that guests will travel takes walkers along the Kapamba River through the some of the most untamed sections of the bush. 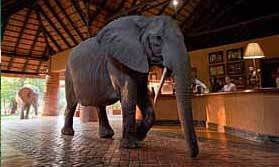 Game activities comprise walking, game drives and night drives. While remote, Zungulila boast all the comforts of home, including ensuite facilities and sweeping views of game from private verandas. Zungulila is a spacious tented camp on a raised hillock overlooking a Hippo Pools Plain which contains a year round natural spring. This cuts large pools through the landscape and to the left of the camp is a sweeping view of the Kapamba River. Each tent has a private veranda perfect for watching the abundance of plains animals that gather to drink at the springs. Each tent is en-suite with hot and cold running water. Guests are accompanied by highly skilled guides, camp staff and trails leader and fantastic bush food is provided such as braais, potjie pots and Mongolian grills. Open: Zungalila Bushcamp is open from May to January each year. Location: Zungalila is in the southern part of South Luangwa National Park overlooking the Kapamba River. Guests arrive into Mfuwe International Airport and are driven the 45 minutes to Mfuwe Lodge for drinks and to freshen up before the 4 hour game viewing drive to Zungalila. Rooms: There are 4 tents in total made up of 2 twins (queen size beds) and 2 doubles with king size beds. The 4-poster beds are fitted with mosquito nets and there is a dressing and sitting area to the side with full length gauze windows. The deck at the front has sun loungers and a small table. The open-air bathroom is discreetly screened, has a double shower, copper bathtub with shower attachment, solar-heated water and a supply of toiletries. There is a hand basin in the dressing area. Lamps provide light after dark. Activities: You can take part in guided walks, game drives, night drives and go bird watching. Facilities: The main area has a large tent that houses the lounge, dining room with the communal dining table, and bar. This leads out to the large boma and firepit which faces the river. There is a large deck for outdoor dining. The camp provides a complimentary laundry service. Dining: Meals are usually eaten together as a group, though private meals on your own deck can be arranged. Children: Children aged 12 years and over are welcome. Families with younger children can be accommodated by need to book the whole camp and hire a private vehicle and guide for the children’s game drives, if the adults want to go on guided walks as there is a minimum age limit of 12 for walks. The camp is not fenced and children need to be kept under supervision. Communication: There is no internet or mobile phone coverage. A superb South Luangwa safari using Bushcamp Company camps. "Lovely spot, beautiful accommodation with the bonus of an outdoor spa bath where you could cool down while watching the elephants. Lovely outdoor eating sitting and eating area with views across the river bed (dry when we were there, but still plenty of wildlife)"
"It is a simple camp but is great for getting out into the bush to be away from civilisation. This is a great area for walking, and being so remote the focus is definitely on the whole experience. I loved the dining deck which looks out towards the river, all set in candle light. "